Dearest Blog: Yesterday it was off to Marquee Cinemas for Cold Pursuit and the Lego Movie 2. First up: Cold Pursuit. Liam Neeson gets revenge in the snow. Action thrillers have become Liam Neeson's bread and butter. There's not much about Cold Pursuit that sets it apart from Taken or Run All Night or The Commuter, except it's quite funny, and I'm *almost* sure that's on purpose. Of course, in a film with this kind of body count, it's a grim humor, but...yeah, I'm reasonably certain it actually means to be funny. It's also super-cold, the kind of cold that makes you cold just looking at it, yet Liam Neeson is perpetually without his gloves. That was my big takeaway, so that probably tells you a good deal about the rest of it. Neeson is enjoyable but unremarkable in a role that, by now, he could play in his sleep. His supporting cast is as good as it needs to be, but a handful of Native American characters who turn up late and don't get enough screen time are the most interesting people in the movie. The action is solid and almost entirely unbelievable, and the picture is paced well enough that--despite playing out predictably--it's never slow or dull. If you aren't put off by literal mountains of snow, the scenery is a real feast for the eyes, too. Overall, if you can put aside the controversy currently surrounding its lead, Cold Pursuit is forgettable good fun. Cold Pursuit clocks in at 118 minutes and is rated R for "strong violence, drug material, and some language including sexual references." If you want to watch Liam Neeson kill something besides his career this weekend, Cold Pursuit is the film for you. Of a possible nine Weasleys, Cold Pursuit gets six. Fangirl points: Nathaniel Arcand! 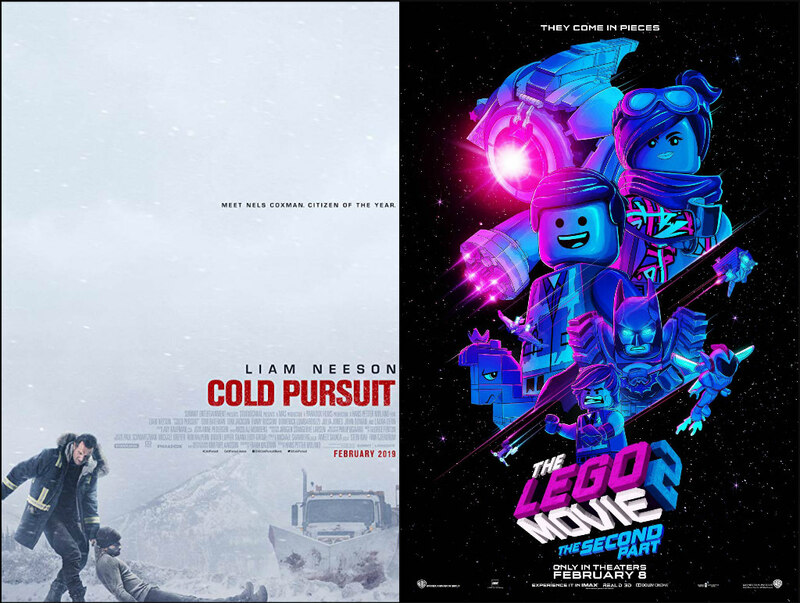 NexDearest Blog: Yesterday it was off to Marquee Cinemas for Cold Pursuit and the Lego Movie 2. Spoiler level here will be mild, nothing you wouldn't know from the trailers. First up: Cold Pursuit. Liam Neeson gets revenge in the snow. Action thrillers have become Liam Neeson's bread and butter. There's not much about Cold Pursuit that sets it apart from Taken or Run All Night or The Commuter, except it's quite funny, and I'm *almost* sure that's on purpose. Of course, in a film with this kind of body count, it's a grim humor, but...yeah, I'm reasonably certain it actually means to be funny. It's also super-cold, the kind of cold that makes you cold just looking at it, yet Liam Neeson is perpetually without his gloves. That was my big takeaway, so that probably tells you a good deal about the rest of it. Neeson is enjoyable but unremarkable in a role that, by now, he could play in his sleep. His supporting cast is as good as it needs to be, but a handful of Native American characters who turn up late and don't get enough screen time are the most interesting people in the movie. The action is solid and almost entirely unbelievable, and the picture is paced well enough that--despite playing out predictably--it's never slow or dull. If you aren't put off by literal mountains of snow, the scenery is a real feast for the eyes, too. Overall, if you can put aside the controversy currently surrounding its lead, Cold Pursuit is forgettable good fun. Cold Pursuit clocks in at 118 minutes and is rated R for "strong violence, drug material, and some language including sexual references." If you want to watch Liam Neeson kill something besides his career this weekend, Cold Pursuit is the film for you. Of a possible nine Weasleys, Cold Pursuit gets six. Fangirl points: Nathaniel Arcand! Next on yesterday's docket was the Lego Movie 2: The Second Part. Everything is no longer awesome in Legoland. Like its predecessor, the Lego Movie 2 is a genuine delight. Top-notch voice work fronts an upbeat, colorful movie with a sweet message. The film’s terrific sense of humor will appeal as much to adults as to kids, and a cheerful score peppered with bouncy original songs is sure to engage the young’uns, and, as one song threatens, end up stuck in your head. As before, the best bits revolve around Batman (offered without bias! ), but, truly, there is not a weak link here. The Lego Movie 2: The Second Part runs 106 minutes and is rated PG for "some rude humor." The Lego Movie 2 is another fun outing foe the entire family. Of a possible nine Weasleys, The Lego Movie 2 gets 8. Until next time... PS: Where's my Cats trailer? in Legoland. Like its predecessor, the Lego Movie 2 is a genuine delight. Top-notch voice work fronts an upbeat, colorful movie with a sweet message. The film’s terrific sense of humor will appeal as much to adults as to kids, and a cheerful score peppered with bouncy original songs is sure to engage the young’uns, and, as one song threatens, end up stuck in your head. As before, the best bits revolve around Batman (offered without bias! ), but, truly, there is not a weak link here. The Lego Movie 2: The Second Part runs 106 minutes and is rated PG for "some rude humor." The Lego Movie 2 is another fun outing foe the entire family. Of a possible nine Weasleys, The Lego Movie 2 gets 8. Until next time... PS: Where's my Cats trailer?